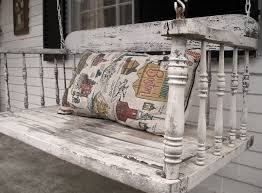 **As a child I would head for the porch swing when it rained in the summertime. I would swing, and get lost in whatever book I was consuming at the time. I love porch swings and wish I had one. My house lacks a proper porch, and only has a stoop. You can’t do proper porch sitting on a stoop, said the Kansas girl. Here in Ireland no one has a porch swing but it is something I really associate with a rural America. I remember my dad’s parents having a porch swing… I miss it terribly. I always find the things I miss, interesting. It always seems to be the simple things. Can’t easily go back, now. I remember the current residents of the house looking at us like “what are those crazy white people in the white car doing around here?” The town is predominantly Hispanic now, so I guess we were gawk-worthy. Never mind the mailbox STILL has my grandfather’s name on it; they probably have no idea “Rey” is not short for “Reyenaldo” and that he was, well, white. Then again, his father was “father of the Mormon Mexican Mission”… long story. You’ve painted a poetic picture of rainy childhood days. For me, it was curling up in bed for hours on the weekends to read that I loved. I would guess most all writers were voracious readers as children, but maybe not. I think my impetus for writing was just to get all my feelings out. Most of the writers I know were voracious readers as children, and continue to be now. Some of my earliest writing was fan letters to my favorite authors. Year, when time allows. I treated myself to a whole chapter of My Highland Lord by Tarah Scott this morning. It’s a historical romannce. Very enjoyable. Oh how I miss my hammock and two palm trees and reading in the mid afternoon. I still got the hammock. But very busy writing now. Maybe I will someday read my own book ‘neath the swaying fronds of islet palms.